Genesis offers indoor and outdoor tennis courts at the Rock Road, Miramont South, Lincoln Racquet Club, KC Racquet Club and Topeka SW locations, and indoor courts at West Central, Overland Park, Westroads, Salina, and St. Joseph locations. 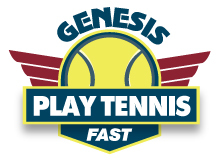 Genesis tennis memberships are designed to measure your playing level and then give you access to a variety of programs including beginner clinics, stroke clinics, league play, private instruction, junior tennis and special events. We have a variety of programs and lessons for players of all ages and skill levels. Want Tennis News You Can Use? Read the latest from National Tennis Director Mike Woody! Do you want to learn the sport of tennis in no time at all? Click Here to learn more about Play Tennis Fast!